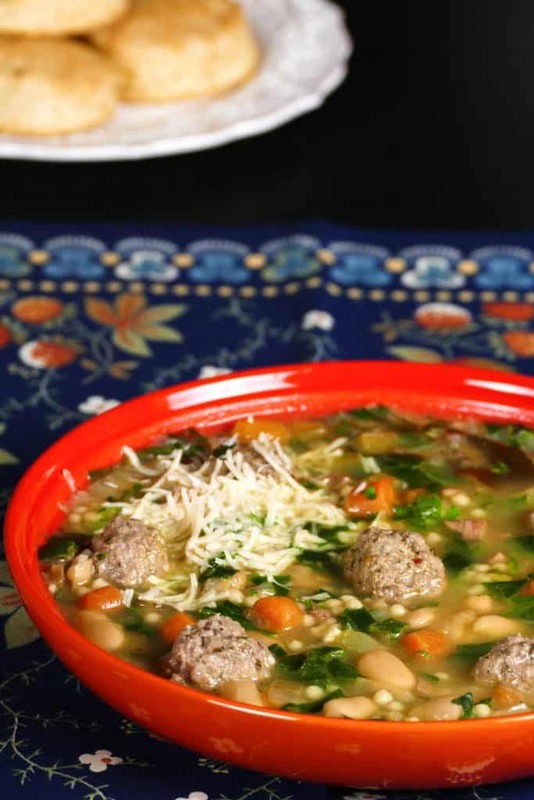 Instant Pot Italian Wedding Soup is a hearty, flavor-packed Italian-American favorite. 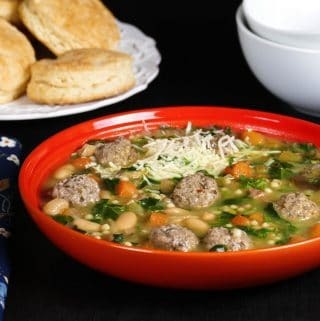 This easy crowd-pleasing soup has the perfect marriage of flavors that comes from beans, spinach, pasta, spices, Parmesan cheese, and mini Italian meatballs. Pressure cooking lets you bring this soup to the table in a fraction of the time. 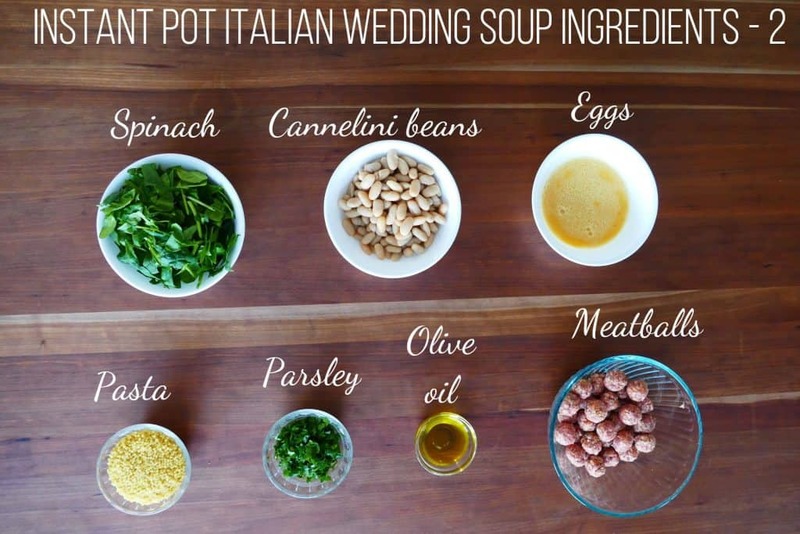 Here’s an interesting tidbit about the origins of Italian Wedding Soup: it’s an Italian recipe imported to America and it’s NOT served at weddings! In fact, the name Italian Wedding Soup comes from Minestra Maritata which is translated as “married soup”, and is so named for the perfect marriage of flavorful meatballs and leafy greens. 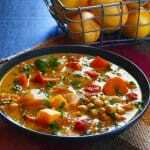 I’ve always loved this soup because it’s so hearty and can be a meal on its own. 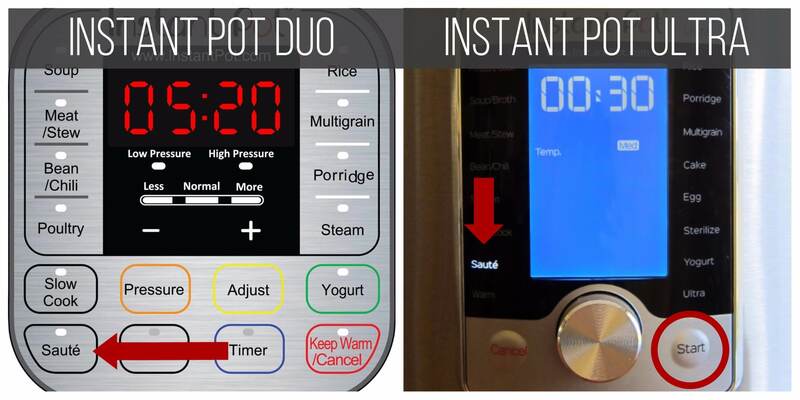 As always, when I’m trying to convert a family favorite recipe to the Instant Pot, I test the recipe out using different methods, trying to achieve a balance between convenience and taste. My recipe for Instant Pot Italian wedding soup calls for pressure cooking the meatballs and pasta together in the broth – convenience without sacrificing taste. The only time commitment for this recipe is making the meatballs. Use your favorite recipe for Italian meatballs or you can go with my recipe. You can substitute chicken or turkey meatballs, or a combination of beef and pork. If you’re not interested in making your own meatballs, you could use premade Italian sausage and divide it into small pieces that you can drop into the soup. I don’t recommend using store-bought frozen meatballs because I find them to be too big. If that doesn’t bother you, feel free to use them. You can also make the mini meatballs ahead of time. Traditional Italian Wedding Soup recipes call for escarole but I substitute baby spinach. Escarole is a slightly bitter leafy green related to the endive. If you want to use escarole, feel free to substitute. I use 2 teaspoons of crushed red pepper in the Italian Wedding Soup and don’t find it to be too spicy. However, based on reader feedback I’ve decreased it to 1 teaspoon in the recipe. So feel free to add more than a teaspoon if you’re not sensitive to spice. I like to use the tiny little round pasta called acini di pepe (pronounced “ah-chee-nee dee pay-pay”). You can substitute orzo or pastina. To check if you need to adjust the cooking time, use this handy guide for determining pasta cooking time from Pressure Cooking Today. If you’d like the pasta cooked al dente, you might want to decrease the pressure cooking time by a minute. 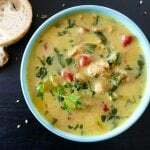 At the end of the recipe, you’ll add beaten eggs to the soup to thicken the soup and give it a rich yellow color. If you were to pour the eggs into the soup directly, you’d get scrambled egg in the soup like egg drop soup – not good! To avoid this outcome, you’ll temper the eggs by gradually warming up the eggs so they don’t curdle when added to the soup. Whisk in small quantities of hot broth to the eggs and then incorporate the warmed eggs and broth mixture to the soup, gradually. If you want to know more, here’s an article about tempering eggs. 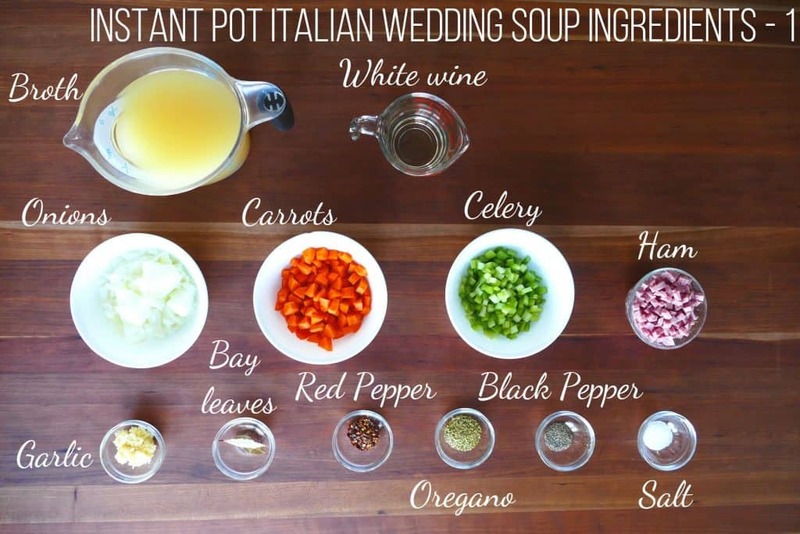 If you’re new to the Instant Pot and aren’t familiar with how to use it, please read the Instant Pot DUO Beginner’s Quick Start Guide or the Instant Pot ULTRA Beginner’s Quick Start Guide first and then come back here to learn how to make this Instant Pot Italian Wedding Soup. Once the Instant Pot has pre-heated, add olive oil and allow the oil to heat up. Deglaze with white wine and stir to remove any brown bits. Add meatballs and pasta and stir gently. Stir in beans and spinach. Allow the soup to cook for another 2 minutes, or until heated through and greens are wilted. Remove the inner pot from the base unit and place on a heat-resistant surface or use a trivet. Add 6 tablespoons of the hot broth to the beaten eggs, one tablespoon at a time, beating well after each addition. 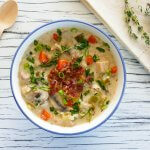 * See tips for more information on adding the eggs to the soup. Looks delicious! You can’t go wrong with a classic. Soup was delish except it was very spicy with the red crushed pepper… will not do next time. I also did t add the ham or egg at the end! Janet, I will go ahead and decrease the quantity of crushed red pepper in the recipe because I realize that most people may not like spice as I do. Thanks for your feedback. Very easy to make, but i made it in a big pot on the stove instead. My pressure cooker pot is too small for this recipe. It also turned out a little too spicy for me, even with only 1 tsp of pepper flakes. Every has different preferences for different reasons. I have a sensitive belly. Will only use 1/4 next time as I still like a little kick. Hi Barbie – thanks for your comment; very kind of you to take the time. I’m glad you liked the recipe! Oh, and thanks for teaching me how to temper eggs! Liked this a lot! I doubled the meatballs because I’m feeding four teenagers, but otherwise pretty much followed the recipe exactly. I didn’t temper my eggs right so they didn’t blend like I’d hoped, but I think it was my error – not the recipe. Still tasted delicious. Will definitely make this again. I’ve done what you did with the eggs before, so I get it 🙂 Glad to hear you liked the recipe, Jen.